The fact that I’m already a third of the way into the final book in the series after finishing Golden Son two days ago should tell you everything you need to know about my thoughts on this book. 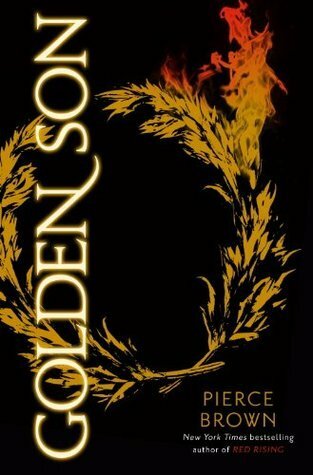 Alas, a sentence does not an in-depth book review make, so let’s break down all the ways I enjoyed Golden Son. You may recall that I described my experience of reading Red Rising as somewhat akin to ‘God hooking you by the nose and dragging you down to the centre of Mars.’ Relentless, exhilarating and exhausting. Golden Son is more like you dove into God’s dirty washing and He accidentally threw you in his cosmic washing machine. I felt like Pierce Brown didn’t tell me a story as much as he suckerpunched me in the gut with a fistful of pure distilled emotion. While it took me a good little while to get used to the first-person present-tense in book one, I was well ready to dig into Golden Son with little trepidation, and the point-of-view suits the story being told so well that I couldn’t imagine it being written any other way. Each character is bursting with a vitality, a life that we can only see through the eyes of our protagonist, Darrow, which paints everyone in a very subjective lens. We hate whoever Darrow hates, we love whoever Darrow loves, and we trust whoever Darrow trusts. This limited scope is maddening at times, but never to the point of immersion-breaking frustration. Every action taken by every character in Golden Son is thoroughly believable within the confines of their world, even though it could occasionally come as a shock to us, the readers. The story is gripping in the way a lion’s claws are gripping to a gazelle; whether you like it or not you’re sticking with it right to the end. The pace is relentless but never rushed, the fight scenes gratuitous but not excessive, the emotion palpable but not cringe-worthy. I don’t know how Pierce Brown has done it, but he’s pulled some old-school alchemical magic and converted a hand-grenade into a novel and I love it! There’s nothing more that needs to be said. If the idea of being able to crack open a time bomb and read its contents appeals to you, then look no further than this entire series. Golden Son receives an entirely warranted 5 stars from me.